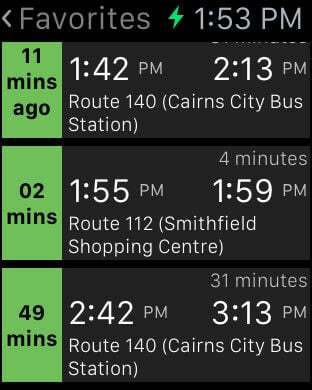 Go Cairns displays Cairns Public Transport timetables data on your iPhone/IPad/iPod. 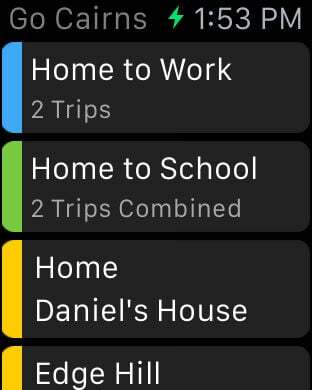 All timetable data is stored on your phone, so it does not require network access. • Over the air updates: Get the most up to date timetables as they are generated. • Location Search: Find your closest station or terminal, searching by name or GPS. • Reverse a trip option. • Departure alarms (time based). NOTE: Timetable data is derived from the web based timetables, so it does not take into account any delays or cancellations. Best efforts are taken to ensure timetable accuracy, but no guarantees are made. If you find an error in the timetable, please email contact@oaksystems.com.au with details, and it will be fixed in the next release. If you have any ideas or find any bugs please contact us. We are working hard to create the best public transport app.